Recently I was commissioned to cover a British Medical Association conference by BMA News. BMA News is the main channel of communication between the BMA and its members, offering up-to-date information about the work of the BMA and policy changes from Governments. 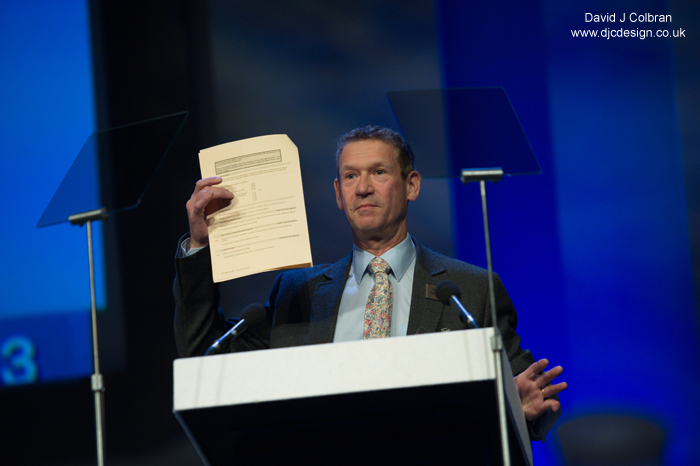 It was at the Liverpool ACC Arena Conference Centre and was attended by about 500 GPs from all around the country. The conference followed a formal programme of motions, with speakers proposing them, then followed by supporters and objectors - at a very quick pace. My brief was to capture every speaker on the stage and importantly a photograph of either their badge or their name as it flashed on the presentation screen to allow the journalists to correctly identify people in the magazine and in press releases. Also required, were images from the morning session, ready for evening press deadlines - so it was a busy hour grabbing a sandwich while editting on my laptop. Fiona at BMA News said "Thanks for the great images and thank you for your work today :) I have just got the Dropbox ones - they came through speedy - hoorah!" If you are looking for a professional event photographer to cover your business conference, please don't hesitate to contact me for a competitive quote.